Radio Silence is the project of vocalist and music veteran Alistair Gordon (Zu Zu Sharks, Bank Statement, Sad Cafe). Gordon has worked with many industry heavyweights, in a variety of occupations, over his 30 year career including Russell Watson, Lionel Richie, Paul Young, Ladysmith Black Mambazo, Lisa Stansfield, The Average White band, Mick Jones, and Tony Banks. Even with such a distinguished pedigree, I've always found his vocal skills and song compositions his most distinctive feature. Whose Skin Are You Under Now, Gordon's third Radio Silence project, is another fine example of this brilliance. On Whose Skin Are You Under Now, Gordon's lead vocals and vocal arrangements, as expected, are lush and compelling. Gordon moves effortlessly between harder rock (Shotgun Love), rock ballads (Staring At The Sun), and straight melodic rock (Hand To Mouth or Mosquito). With the latter style, the album lends itself more towards an AOR style above anything else, and at times can feel slow. Yet, even these songs, like When The Lights Go Down or One Day At A Time, are blessed by Gordon's inimitable vocal style and the crisp production. I'll favor the more upbeat melodic rock numbers like the aforementioned Hand To Mouth and Mosquito, but also the immensely entertaining Somethin' Going On. Gordon also pulls some Beatles out of his hat showing again his amazing range on Hide Your Love Away. Whose Skin Are You Under Now from Alistair Gordon's Radio Silence project is another showcase for his brilliant vocal skills and song arrangements. Lovers of all things melodic rock and AOR will find this a plentiful and satisfying platter. Recommended! 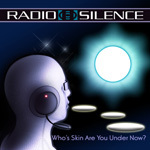 Whose Skin Are You Under Now from Alistair Gordon's Radio Silence project is another showcase for his brilliant vocal skills and song arrangements. Lovers of all things melodic rock and AOR will find this a plentiful and satisfying platter.